In the past 16 years, the human footprint has increased by 9%. This increase has implications for the environment, and for biodiversity conservation. Central Africa, South America and South-East Asia are the areas which this increase in human footprint is impacting on the environment the most. These human pressures are rapidly intensifying over time and are widespread throughout these areas in particular, which have a wide range of biodiversity. In the last 16 years, the biggest impactors in these areas have been crop lands which have seen a 20% increase in impact, and population density. The global population is said to increase to 10 billion from the current 7 billion by 2100, highlighting an increase in environmental pressures. Recent studies have found that the more suitable an environment is for crops, the more environmental strain felt in that area. While these findings should not be surprising, it is becoming increasingly detrimental to the biodiversity in these areas. Maintaining areas of high biodiversity, such as in the Amazon where natural resources are abundant and exploited will take extensive restoration work. The environmental Kuznets curve is said to align with some of these findings, so it isn’t all bad news. 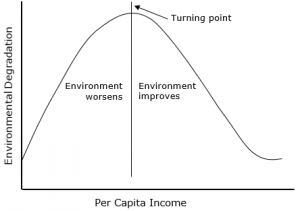 The curve (as shown below) indicates that as a country’s per capita income increases, the environmental degradation decreases. Given that Central Africa, South America and South-East Asia all have relatively low per capita incomes, it has been theorized that when this increases, there will be a decrease in the environmental pressures felt. These trends appear to be happening in other parts of the world which have been experiencing high levels of economic growth, such as parts of North America, North-Eastern Europe and South East China. Looking at the 73 most rapidly expanding economies, 47 experienced increased human related pressures on the environment, while 26 reported reduced pressures. The map below provides an indication of the changes in human footprints from 1993-2009. Absolute change in average human footprint from 1993-2009 Source: Oscar Venter, et al. “Sixteen years of change in the global terrestrial human footprint and implications for biodiveristy conservation”, Nature Communications, August 2016. As indicated on the map below, the countries which experienced the greatest reduction in human footprint had high levels of urbanization, health and education, and low levels of corruption. These countries also had a tendency to be net exporters of agricultural products, not just outsourcing their environmental impacts. As well as this, while a 9% increase in human footprints may seem like a lot in 16 years, during the same time period the global population has seen a 23% increase, and the global economy has risen by 153%. This indicates that economies can continue to strengthen and grow without the heavy use of non-renewable, or environmentally damaging resources (see October blog on growth and resources). Given the federal government’s commitment at the G20 summit in Paris to reducing emissions, it is disheartening to note that the report detailed if every country emulated our environmental actions, global warming would rise by 4°C, instead of the minimum target of 2°C. The policy measures currently in place do not take enough measures to ensure we can reduce our human footprint by 2030, given that trends show we are continuing to degrade our environment. Clean environmental policies, better management, and incentives are needed to ensure that economic activities and the natural world can continue to co-exist both in Australia and globally.